All five teams realistically control their own destiny, as they're packed together closely and they have 8 or 9 games left. Something like 6-3 over the last 2+ weeks would pretty much assure any of them of a spot, though in the case of the Oil, they might not want those '3' to be the wrong three. Based on both their remaining schedules and their wee headstart, the Oilers and Ducks are the best bets to get home, though the Flames could spoil a lot for the Oil (and Wild). Speaking of the Flames, they're in Columbus tonight, and no I'm not brimming with confidence. The lads haven't had much success this season in the second half of back-to-backs, and the BJs are a good team who handled them last game at Nationwide (and significant parts of the two at the 'Dome). But, what the hey. Calgary 3 (Moss, Iginla x2), C-Bus nil (McElhinney!). Go Flames. Why Calgary? It HAS to be Calgary. As the Oilers chances at a playoff spot get better and better, the mind naturally starts to turn towards the most desirable opponent for the Oilers. As I see it, they're going to be the decided underdog against anyone. They're most likely going to lose and lose quickly. It just isn't a particularly good team. With that said, the opponent might as well be Calgary. Two reasons really. First of all, the Flames should win this hypothetical series. If the universe unfolds as it should, they will. No real bragging rights for Calgary would accrue from beating the hapless Oilers. On the other hand...if Roloson started channeling his (slightly) younger self, if Olli Jokinen is the chemistry destroying Nazi war criminal that the NHL media would have you believe that he is, if Dion Phaneuf continues to show himself to be the consumate Calgary Flame what with his playoff immolation...well, if Edmonton somehow even pushed the series to six games, that would basically be a win. If they actually WON the series, they might as well just move the Flames to Red Deer or something and try and convince the more successful Sutter to leave New Jersey and run the team. It's hard to think of a loss that would be more humiliating for the Flames than going down in defeat to this particular bunch of Oilers. Can't find any video of this unfortunately. If you know where I can find video of Krushelnyski managing to get the puck about a foot off the ice to score the OT winner while Mike Vernon waves his comically short arms at the puck, let me know. "Home ice advantage is EVERYTHING! Flames fans, tonight your team needs you. They need your loyalty, they need your heart and most of all they need your deafening cheers." **It's happening -- the Oilers are on their way to qualifying for the playoffs. You still only get 2 points for an 8-1 Win, not 4 or 5, but it looks awfully promising for the the greasers. 4 of the next 5 on the road (two back-to-backs if you count tonight), then 6 straight at home before the finale in Calgary. Oil fans might want to hold back for the moment on purchasing that 10-pack of car flags -- the opposition over these final 12 is pretty strong, and/or gunning for the same spot as them -- but odds are. **Know what I did earlier this week? Took the #8 bus. Regrettably, the chatter was somewhere between subdued and non-existent. **Yes, I'm now in Edmonton. I've been living (and dining!) chez Sacamano, and it's been great. I like the city, with the obvious caveat that there are too many Oiler fans around for my liking. **The Canucks have, unexpectedly, made this NW race look interesting. Barring a serious Flames slump, I think this 6-game roadie the Canucks are about to start will take care of the remaining drama, but the landscape has definitely changed. The Hawks don't look so tough any more; it's getting to the point where the BJs might be a tougher matchup. The Wild have been scathed by their March From Hell, but the worst is over and they're still in decent position: BIG GAMES against the Oil these next two Sundays. And even the Ducks' position looks suddenly favourable (in the context of squeezing in); two games each remain against the Oil, Avs, and Coyotes, which sounds to me like a Recipe For 8th. Maybe we'll finally get that Battle of California. **Blues @ Flames, 7PM MT, RSN West. Calgary has played some nice games against St. Louise over the past couple of seasons, and even the mediocre ones have come up as Ws in the end. They're a good bet to outplay the Blues 5v5 tonight. But as Kent has been pointing out lately, the Flames PP/PK have been struggling, and both are relatively strong points for Blues. I wouldn't be at all surprised to see another 2-1 Calgary victory (Moss 5v5 in the 2nd and 4v4 in the OT). Go Flames. 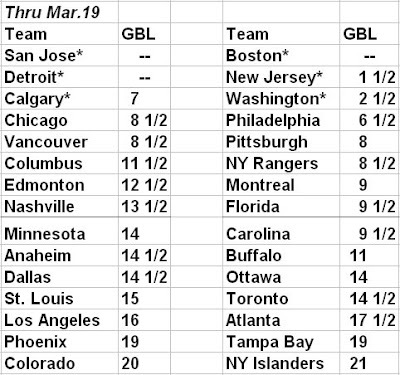 So you can't like the Kings chances of hanging onto the edge for much longer, and the Oilers seem like as good a bet as any to start the playoffs on the road in San Jose or Detroit. Here, boy, waste your time! Think you can do a better job of predicting future games than the mindless mathemagical weighted randomizing of Mudcrutch or Sports Club Stats? 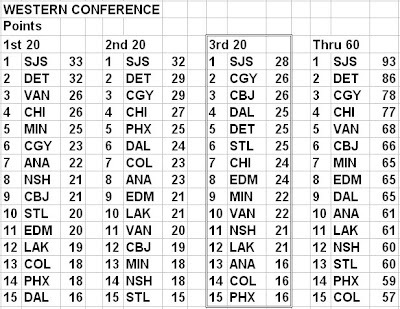 Here is this year's edition of Sacamano's Western Conference Playoff Predictor. I'm sure there are better ones out there, but I had it ready, so I might as well post it. As in the past, just enter in your predictions for the remaining games, and it will spit out the final standings. Alas, I'm not still not web-savvy enough to make it an online interactive deal, so you will have to download and/or open the excel file on your own computer. If anyone out there wants to put it up in web format (if such a thing is even possible), you are more than welcome to do so. 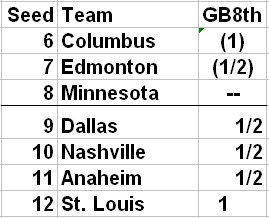 As in previous years, I've still been too lazy to design an array formula that will take into account the divisional leaders, tie-breakers, etc., in the rankings. So, you will have to use your own grey matter to sort that out. Also, I still haven't done one for the Eastern Conference. I just couldn't bring myself to design something for the abysmal, pathetic, SE Division. I've put in my best guesses for the remainder of the season. As MF likes to say, your mileage may vary. Flames @ Devils, 5PM MT, Flames PPV. I'm feeling a bit poor right now, so tonight I'll be skipping the PPV and instead flipping between the Oil v Gainey game and the Brier. Today's interesting story: Brent Sutter homesick for Alberta. Could I have been 3 years early with my prediction? Flames 2, Devils 1. Habs 5, Oilers 0. Manitoba 7, Ontario 5. Go Flames. Flames @ Thrashers, 1PM MT, RSN West. So I was slightly optimistic about Friday's tilt with the 'Canes when I posted. Then I went out and about for quite a while, and after listening to the FAN for much of the afternoon, I was pessimistic to the point of panicked. The long-term optimism from Kerr et al was moderated (they weren't planning the proverbial parade route), but the level of certainty that the evening's game would be a W was just alarming. Sure, the Flames were playing Pt2 of a B2B, and they've played lousy in front of McE all season, and they're racked by injuries, and Carolina is a pretty decent team (note: none of these things were actually acknowledged), but "the confidence in the room, with these new additions, is... there's really something there" (I quote from memory). etc. -- and winning road games are difficult no matter who the opponent. Atlanta is not a very good hockey team, but they have two excellent players who can win the odd game on their own. Staying out of the penalty box is a good first step towards neutralizing Kovalchuk, while spending a lot of the game with the puck in and around the far goal is a good first step towards neutralizing Lehtonen. I’m not exactly a fan of Don Cherry—not anymore, anyway. He can barely string three words together, let alone a sentence; he seems to get angrier, for some reason, as the years go by; and he makes a completely unjustifiable fortune from CBC. But the contrarian streak in me can’t help but defend him against people whose prejudice against him is as bizarre and overwrought as any of Cherry’s own—that is, I can’t help but defend him against just about every hockey writer in Canada. Whatever it is about him, there seems to be a remarkable unanimity among that fraternity: the shootout is great because the fans like it; fighting is bad despite the fact the fans love it; and Don Cherry is an awful, awful man. I have always maintained that your average six-figure-earning Toronto executive is far more prejudiced against European skaters than Cherry is, which explains why Wade Belak was considerably more popular during his tenure at the Air Canada Centre than Mats Sundin. I suppose you could consider this “xenophobia,” as the Star’s editorialists do. I consider it perfectly natural, though in Belak's case undeniably infuriating. But either way, a fact’s a fact. **Olli Jokinen -- what a disaster! HAHAHAHAHAHA oh, also Leopold looks like he never left. **So just in case this wasn't the case before, I assume we're all hoping that the Ducks wither away without much of a fight. Why would anyone (aside from their primary fans) hold any vaguely warm feelings about them at this point? They just won the Stanley Cup, and now were sellers at the deadline, a week after the GM gave a giant MEH to 7th/8th place. **Think the Canucks and Blackhawks are going to have scouts at each other's games much over the next month? **Flames @ Hurricanes, 5PM MT, RSN West. The PPV last night was very enjoyable. I like Kerr in the PbP role, and the production of these things has just advanced a thousandfold in the past 2 seasons. Tonight, with Peter Loubardias on the mike, the Flames face Erik Cole for the 5th time this season. The first four times, he was probably the best player on his team. With the lads playing part two of a B2B, I'll take Calgary 4 (Iginla in OT, Phaneuf, Aucoin, Moss) Carolina 3 (Cole, Staal x2). Go Flames. Glass Half Fu.. err, "the water reaches the midpoint of the glass"
Time for a more balanced trade review, certainly. Yes, the figures I posted yesterday lack context. The underlying numbers showing Lombardi as a superior EV player to Jokinen are heavily influenced by the quality of their teams and teammates. I certainly don't think Curtis Glencross is a better player than Shane Doan, but the same comparison (in the same categories) would give a distinct advantage to the Flame. He could absolutely fill the net up. In the 3 post-lockout seasons, Jokinen is T-10th in goals (111) and 2nd in Shots on Goal. This suggests to me that his scoring isn't dependent on his aim being hot, or what have you; it arises from sheer volume of shots and chances created (which is less variable on a week-to-week basis). Put another way, there are 15 guys who scored 100+ goals in those three seasons, and Olli's Shoot% ranked 15th among them. Going forward, that's basically a good thing. It's possible that, on a better (playoff-bound) team with better teammates, his enthusiasm, energy, & effort will be better shift-to-shift, and his results will improve accordingly. Cammalleri-Jokinen-Iginla, followed by Langkow + 2 of Bourque/Moss/Bertuzzi, might be the Top 6 that the coach has been dreaming of. I fully expect Keenan to run the first trio against the other guy's 2nd/3rd lines and have Langkow taking on the toughs. 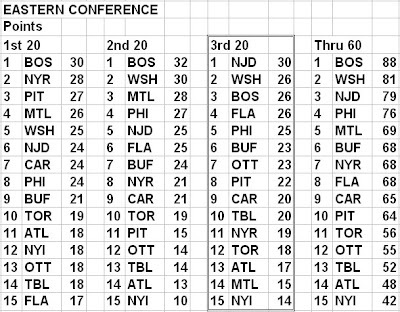 And particularly if Bourque and Moss are the "+2", I think there's a great chance that it works. As far as I'm concerned, Langkow is still the #1 centre on this team (certainly 5v5). The problem, such as it is, has always been that Iginla with Conroy or Lombo has never reliably been able to punish lesser competition -- but if you put Langkow with Iginla, then the leftover line can't win because they don't quite have the scoring, and they're just not good enough. (1) He's past his prime. There's no magic age when a hockey player starts to get old. His Shots/Game rate is down by 29% this season, despite identical PP time to last season and only a bit less EV time. He might just be wearing down. 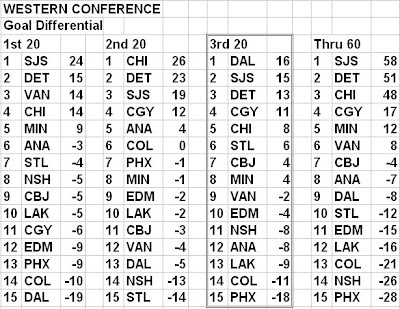 (2) The Western Conference and the Southeast Division are, in a sense, different leagues. There aren't many happy endings when it comes to players moving from the SE to the West. Brad Richards has maintained the post-contract scoring he had in Tampa since moving to the Stars (though hasn't regained the pre-contract numbers). Marian Hossa's points/gm are down a hair from his Atlanta years, though no one cares because he's still excellent. And those are the success stories. Jokinen, Cole, not so much. Then there's the guys who looked like they might just be out of a career, only to move from West to SE and suddenly look pretty good again, like Reasoner and Samsonov (the opposite happened to Gelinas). The point I'm getting at here (apart from Enjoy Justin Williams, Los Angeles!) is that some of Jokinen's drop this season was to be expected, and that to some extent it's the Phoenix numbers that are the real ones, at least in the sense of what we can expect from him as a Flame. **Even going back to last season, Jokinen has been a minus player with pretty mediocre 5v5 offense. Some of this is team effect, but a good player on a bad team is still a good player (for a good example, see Tuesday's post). For him to be a real help, Jokinen will have to be an asset at EV, even against good lines -- not a quasi-liability that needs shelter to be effective, or an outright liability like Bertuzzi. **This isn't a concern so much as a note: while I'm the last person to worry about faceoffs as a key, Jokinen is awful at them. 42.2%, good for 85th/87 among NHLers with enough attempts. The odds are that the Flames have a new top-line centre who won't take faceoffs, as Iginla will take them on the right side and Cammy will take them on the left. I think it's quite likely that the Flames are a better team today than they were Tuesday (acquiring Leopold added quality, not merely depth, on the D). I think they have a better chance of winning their 1st-round series, and a better chance of a deep run (I take TB's point but don't really agree with it). That said, I wonder if it won't get a bit ugly here for a while, if not now then shortly. The combination of (A) the injuries, (B) the next 6 on the road, and (C) the fact that the PK was due for a bit of a dive even with Lombardi, makes for some potentially tough times. The sooner that Langkow and Bourque are well the better. Go Flames. Matthew Barnaby: "... I talked to players in the Western Conference (about the Jokinen deal) and they said 'Great'... 'He's a cancer'" Wow. If Phoenix hadn't tossed in the 1st round pick, I'd have said this was a bad trade. Wait, WHAT? So that's the glass-half-empty look at this. This is my first post about hockey here since October. So...see you in July! Flames @ Senators, 530PM MT, Flames PPV. Here's something you probably didn't know about Ottawa's Big Three One. Vic has mentioned over the years, generally in passing, that Alfredsson is the one who drives the bus in Ottawa. He was right! The Senators are a much better team with Alfie (#11) on the ice than on the bench; that's no shock, he's a terrific player and has been for ages. What is shocking is how poor the Sens are when one or (generally) both of Heatley (#15) and Spezza (#19) are on the ice without Alfie. By raw numbers and by For vs Against ratios, the Sens are actually worse with Spezza and/or Heatley on the ice (sans Alfie) than they are with their depth and scrubs. Some of this is due to competition effects (not many coaches are sending their 4th line out against Spezza/Heatley, even without Alfie), but seriously folks: two $7M forwards in their mid- to late twenties should be outshooting, outchancing, and outscoring their opposition, no matter who the hell it is. Calgary 3 (Iginla x2, Phaneuf), Ottawa 2 (Alfredsson, Schubert). Go Flames. Winner: the team who pries Kari Lehtonen out of Atlanta. He's going to be a headache to sign as an RFA; he's had injury issues; and most importantly, "yeah, he puts up nice SV%, but his team still never won". Considering the Roberto Luongo deal is one of the consensus Top 3 Most Lopsided Trades of the Decade, and that was almost exactly the book on him in summer '06, it would be a very good 'gamble' for a GM to acquire him. Then just sit back and let the "his new surroundings have really invigorated him" stories wash over you. Loser: Brian Burke, if he really trades Tomas Kaberle. Yes, he has more value than almost anyone in your organization, but what (or, when) exactly are you building for? If Burke can dump a contract or two here, and get some better goaltending before September, the Leafs are probably a good team next year (I assume they're adding an elite player or two on July 1). Kaberle has a very reasonable contract for two more years, and past that is a long damn ways away. Trading him for "future value" implies, IMO, a degree of foresight that probably isn't possible given everything that you don't know about what will happen over the next 2+ years. Winner: the team that can acquire Milan Hedjuk. As far as I'm concerned (and certainly in the games I've watched this season), Ryan Smyth delivers on his contract -- but I can't imagine that (with the dollars and term remaining) he's movable. Which means that the Avs might be pushing to move Hedjuk, which means someone else should be jumping at the opportunity. He's not a passenger; he's a fine player in his own right that has been delivering results -- outscoring results -- for years. And at ~$4M he's good value for it. Loser: Jacques Martin. Because you know he's going to screw this up somehow. The correct move is almost certainly to deal J-Bo, but get some good present value along with future value. And given the cap/economic situation that some (many?) 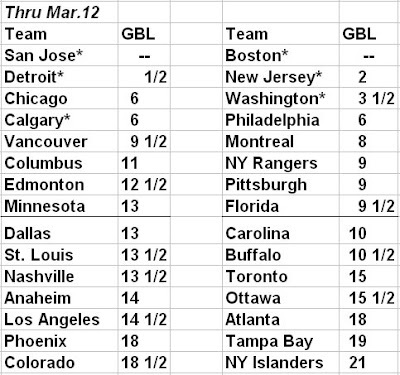 teams are in, I'm equally almost-certain that it's possible. Fr'instance: the Flyers are apparently interested in Bouwmeester, and are hard up against next season and beyond. Why not get Timmonen+ in return? He has a cap hit of $6.33M for the next 4 years, but you're only paying him $5.5M per. You've replaced your shutdown D, and relieved the Flyers of some $$ problems. McCabe is your main PP guy, etc. Naturally, it'll end up being Lupul+. Winner? Loser? : Darryl Sutter. I'm definitely biased (personality-wise) towards the Stand Pat end of the spectrum. My biggest hope is that he doesn't deal anything of value for Olli Jokinen; I just think you can do as well for a smaller price and a cheaper ticket. I also hope that the annual acquisitions of (A) depth on D and (B) a backup goalie go for naught. Warrener is recovering from injury, and Eriksson is on the farm: this should be adequate as 6th-D Insurance. The backup G isn't going to play, and even if he does, there's scant evidence that whatever veteran flotsam is available for cheap is a superior option to McElhinney. A sound 2nd/3rd-line type (i.e. another Bourque/GlenX/Moss). Due respect to Marty Reasoner, what I'm talking about is the tier(s) just above him. If TB is really looking to move Jeff Halpern, I'm interested. Not much that's surprising in the Q3 WC results. We see just how much ground the Ducks lost to their fellow residents of the bubble (and why the Coyotes plummeted down the standings). We also see that even having slipped by both measures from Q1 to Q2 to Q3, the Sharks are still the best team in the conference. The Devils have been playing like the best team in the East. The Habs' lousy results were bought & paid for with their inability to score and prevent goals. And the Rags are probably fortunate that they didn't fall even further, though that 10-2 L to the Stars pollutes their G.D. pretty badly. Lightning @ Flames, 6PM MT, RSN West. 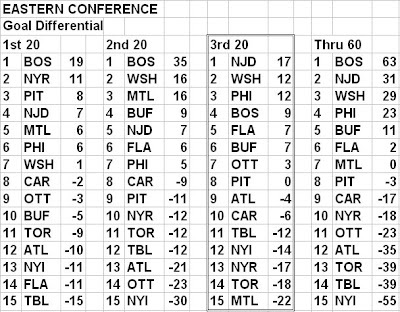 At left is the playoff bubble after this afternoon's games. Kings are out (13th, 2.5 back) -- losing 3 straight (and 5 of 6) when you're already on the unhappy side of the line is just a killer. Let the picking over of LA's roster begin! As of right now there are four NW teams in the top 8, three Central teams, and just the Sharks from the Pacific. This is probably untenable; pretty soon the interconference play, and even most of the interdivision play, will be over. Whatever; big, big ups to the Predators and the Blues for staying alive. **Daymond Langkow's brokenERRRR, "bruised" hand will apparently cause him to miss the Flames' 7-game roadie that starts Tuesday. Bad news that it's that serious; good news that they're not jacking around with the healing process. In related news, I'll be shocked if they do better than 3-3-1 on that trip. **With their loss to the Pens this afternoon, the Stars have managed to lose 5 straight games -- all at home. I think the solution is to dismiss Sean Avery from the team; that dude is a cancer. **And yes: in case you missed it (like I did) or didn't hear about it elsewhere, Dellow and I got a shout-out from Ron Maclean last night in the 1st intermission of MIN-EDM. Thanks for the kind words, Ron. You can see the video by going here; then under 'Choose A Category' towards the right, click on 'Hockey Night in Canada', then 'Coast to Coast'. The clip in question is marked Coast to Coast: Feb 28. Maclean had a discussion with Hrudey and Milbury about Tyler's post wondering why Pisani and Moreau got so much TOI late in the loss to the BJs (particularly the final 6-on-5) while Penner and Cogliano were welded to the bench. It was a bit dissatisfying (the discussion, that is), so I hope to have a chance to post on it in a bit more depth. "I'm so appreciative of good wishes from Ron MacLean that now I'm going to tell him how to do his job" -- that kind of thing. 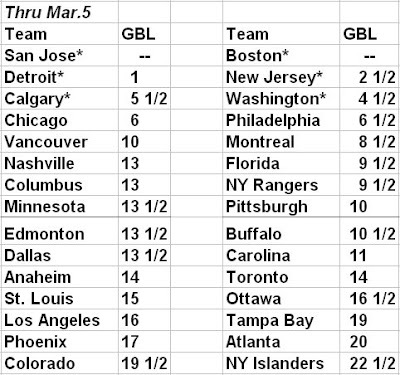 **Calgary 4 (Moss, Lombardi, Aucoin, and Iginla with the SO winner), Tampa Bay 3 (whatever). Go Flames.